Look, we don’t want to alarm you, but…it looks like your toddler has somehow been able to shed their Epidermis. Is this a family thing? Because if it’s genetic, then whew! You probably already knew all about this crazy trick, and in fact, were expecting it. And if so, congratulations on having a crazy cool gene pool! Let’s definitely grab some coffee sometime so you can tell us all about your ancestry and how you came to possess this trait. Also, is the scientific community aware that you can do this? Not that we’d tell them, but…are they? Do they know? Do you need protection from the government? Because we might know some people…nod yes for yes, and shake your head no for - you probably guessed it! - no. But if you didn’t know, then…hey, it’s okay! Nowadays, there’s no telling what our kids can do that we can’t, right? For instance, our kids could take down our entire WIFI and cable network if they wanted to. We don’t even know how to restart that router thing that everyone’s always talking about! Kids, huh? Ours are tech genius, yours wears their skeleton on the outside of their body. What a crazy world we live in! 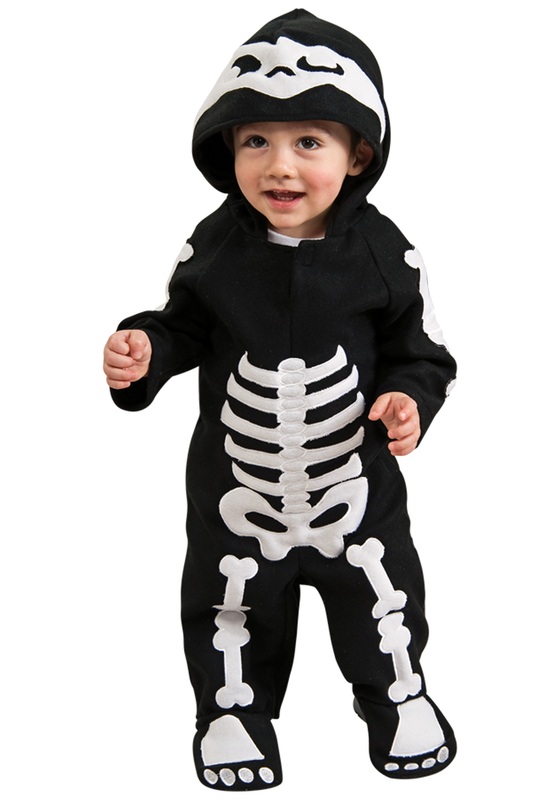 But listen, just in case it gets cold out and you don't wanna cramp your toddler's style, take a look at this Infant / Toddler Skeleton Costume. The black fleece romper with a printed bone design will keep your little one warm while also letting them know that, hey, you accept them just the way you are! You're not trying to change anything about the way their body was made! There's also a cute hoodie headpiece with a skull design, and stretchable footies that cover your child's shoes (quick question - does your child even wear shoes? Or is this where those weird-looking toe shoes come in really handy?). And it all fits with Velcro along the back, making it easy to put on and take off! It's so comfortable, your kid will want to wear it everywhere (which could be really nice for those times when you don't want to deal with pesky, over-curious questions like ours)!